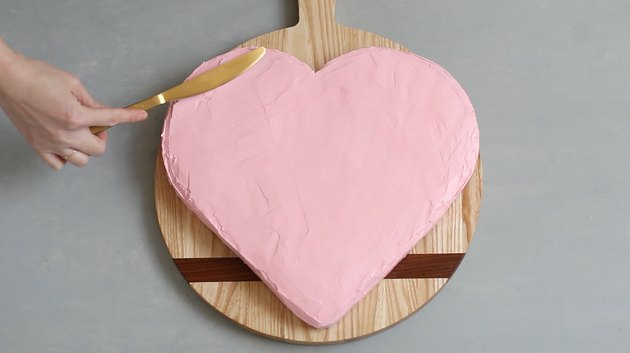 Love is in the air with this homemade conversation heart cake. And you don't even need a heart-shaped pan to make it. We've got a hack using pans you probably already have in your kitchen. 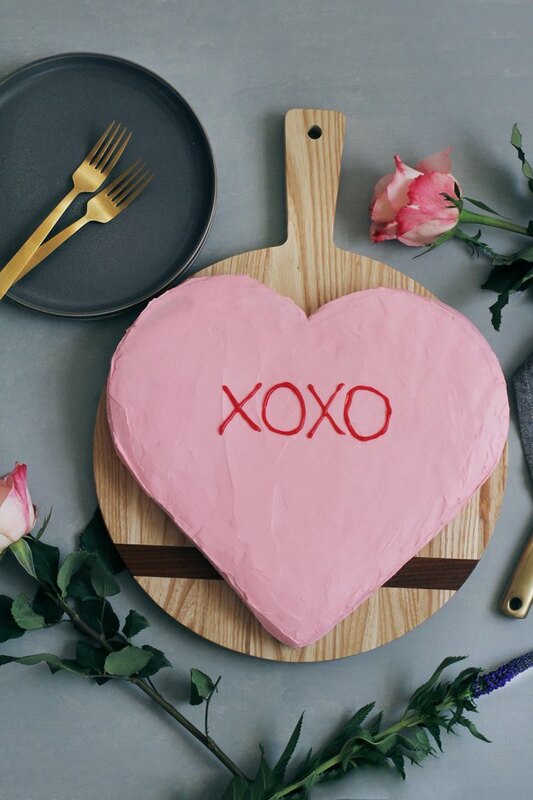 They say the way to the heart is through food, and we guarantee your special someone will most definitely feel loved with this heart-felt confection of affection. 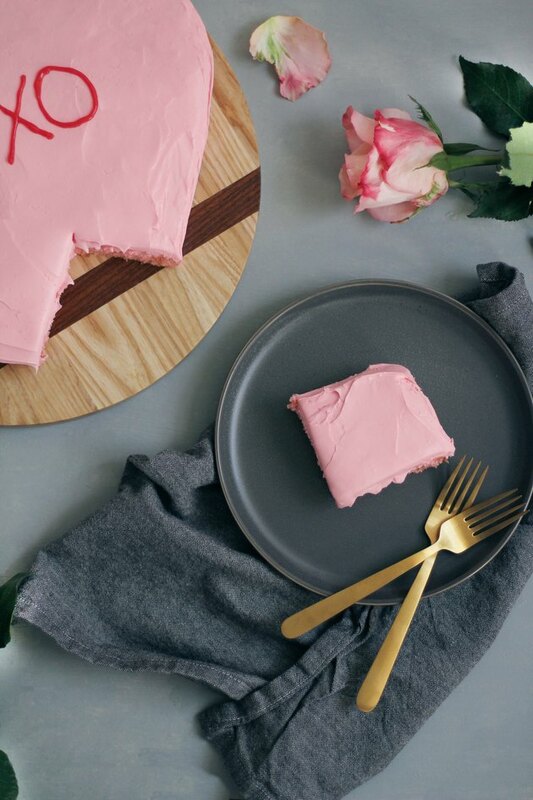 We used an 8" round pan and 8" x 8" square pan for this cake, but you could use a different size. The important part is that the diameter of the round pan is the same length/width of the square pan. 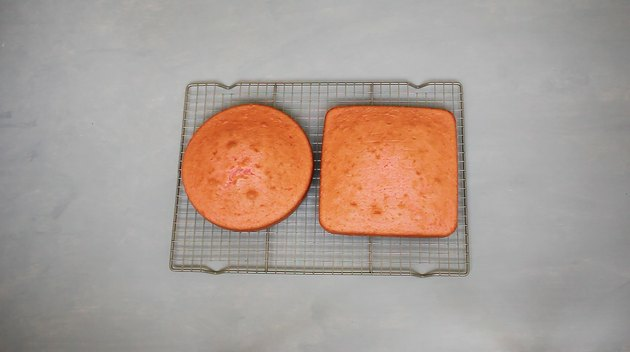 Mix up your favorite cake batter and divide it evenly between the square and round cake pans. 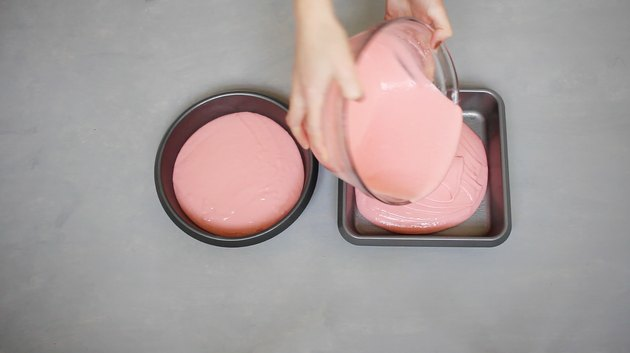 We used a box strawberry cake mix. Bake the cakes per the recipe's instructions, and then allow them to cool completely on a wire rack. 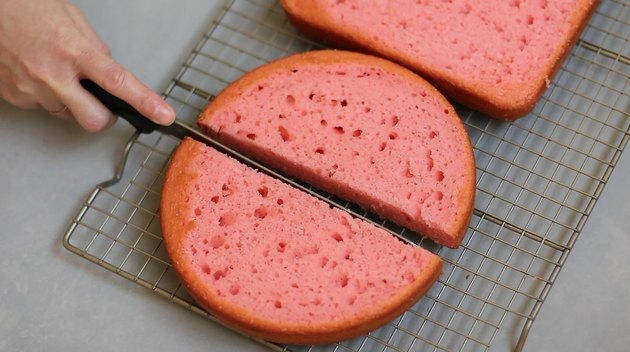 Trim off the tops of both cakes so they're even. 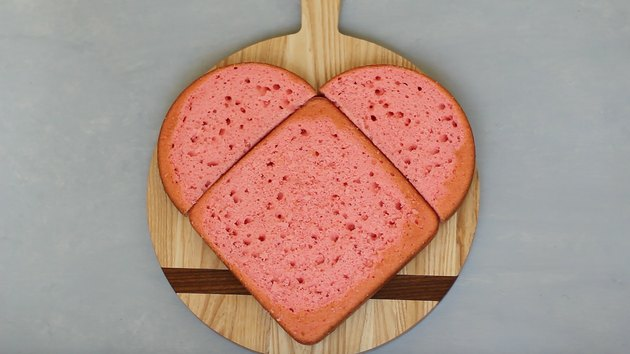 Rotate the square cake so it's in the shape of a diamond on your cake platter, and then place each half of the round cake above it to form a heart. 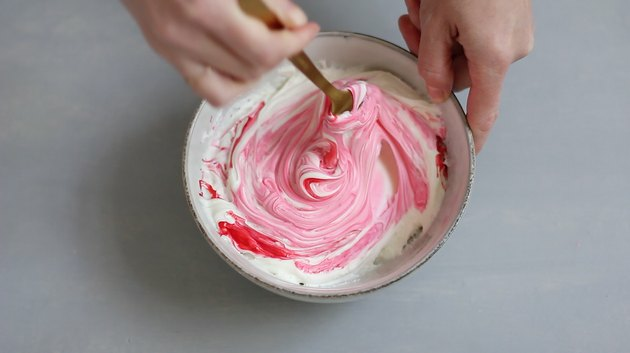 Add several drops of pink food coloring to your favorite buttercream frosting and mix it together. 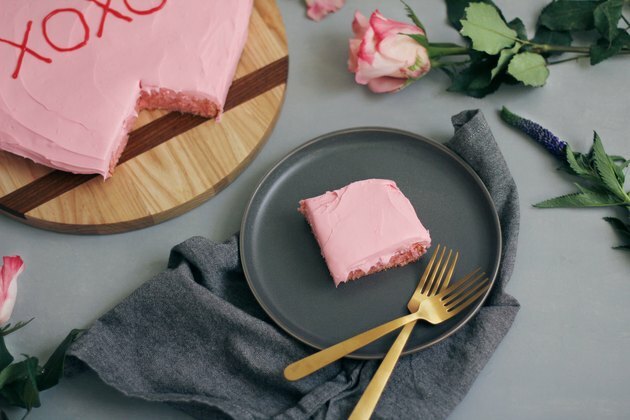 If you want to be extra, we love this sparkling rosé buttercream frosting! Frost the cakes together. 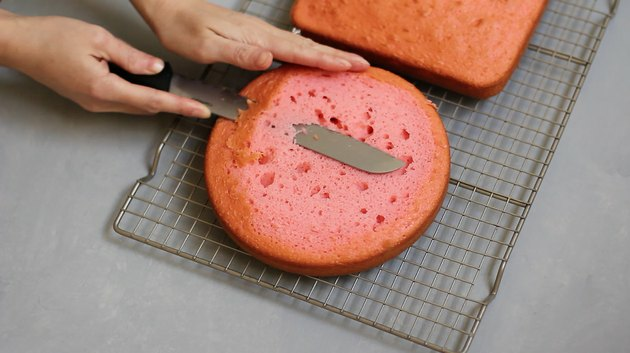 We recommend frosting a light crumb coat first, letting that harden a bit, and then frosting a smoother coat on top. If you dip your frosting knife in a mug of warm water every so often and wipe it off, the heat will create a very smooth texture on the frosting. 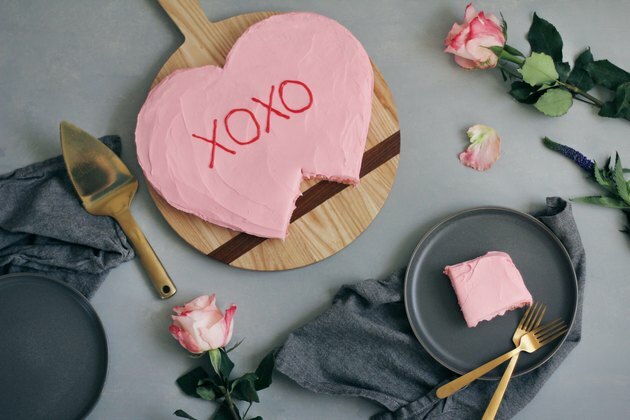 Use red icing gel to write a sweet message on your cake. 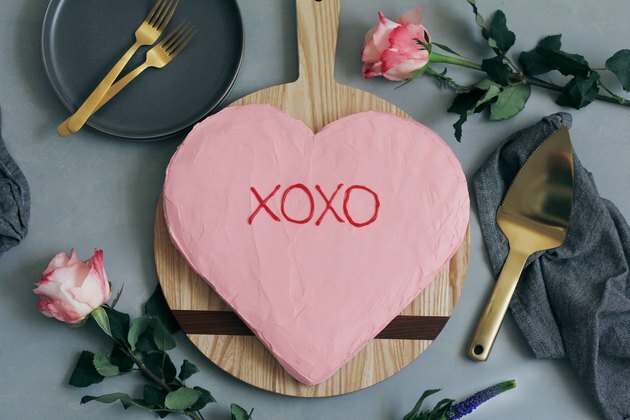 You could stick to classic conversation heart sayings like "Be Mine" and "XOXO," or mix it up with more modern phrases like "BAE" and "For Like Ever." Also, if you're unsure of your cake writing skills, you could always use candy letters or cut some out of fondant. Now all that's left to do is slice and share!